Above left: Camp flag of 20th USCT Regiment. Above right: 26th USCT's Regimental flag with motto God and Liberty. Both regiments mustered in and trained on Rikers Island. Before becoming major bases of operations in New York City Correction history, Rikers and Hart Islands served as military bases for New York State's three regiments of African-American soldiers in the Civil War. These more than 4,000 Black servicemen formed New York's 20th, 26th and 31st regiments of what was then called the United States Colored Troops (USCT). They were among the more than 180,000 Black soldiers and sailors whose military service on the Union side was recognized in ceremonies July 15-18, 1998, related to the unveiling of the African-American Civil War Memorial in Washington, D.C. The 20th and 26th USCTs were organized on Rikers Island under the commands of Colonel Nelson B. Bertram and Colonel William B. Guernsey, respectively. 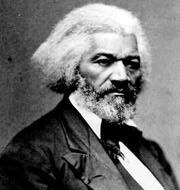 "Once let the black man get upon his person the brass letters, U.S., let him get an eagle on his button, and a musket on his shoulder and bullets in his pockets, and there is no power on earth which can deny that he has earned the right to citizenship in the United States." The 20th USCT was mustered in February 9, 1864, on Rikers, training there about a month before being sent to New Orleans region (known as the Gulf war zone or department) where its members demonstrated their bravery in the Battle for Port Hudson. They also saw duty in Texas, Florida, and Tennessee before being mustered out October 7, 1865. The 26th USCT served under the Department of the South (Union Army) in South Carolina and was very active on Johns and James Island, Honey Hill, Beaufort, and a number of other locations. Two officers and 28 enlisted men killed or mortally wounded, and 3 officers and 112 enlisted died from disease. The 31st USCT was organized on Hart Island during April 1864 under the command of Colonel Henry C. Ward. In May 1864 the 30th Connecticut Colored Volunteers consolidated with this regiment. Additionally, a number of Black Canadians and other foreign born Blacks served in the New York regiments. From Hart Island, the 31st departed for Virginia where it was active in a number of battles, including the siege of Petersburg. The Hart Island regiment was there during the mine explosion and the fall of Petersburg on April 2, 1865. It pursued Lee's Army from April 3 through April 9 and was at Appomattox before, during and after the Confederate surrender on April 9, 1865. The African-American Civil War Memorial is being constructed as a semicircular, three-foot high curved stone inner wall with stainless steel plaques bearing the names of all the Black soldiers and the white officers who fought beside them. Names of Black sailors will have a place of honor nearby. There will be a six foot-wall which will separate a semicircular outer wall where additional names will be placed. 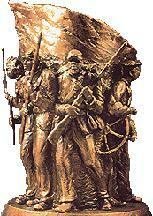 The monument will also include a sculpture by Ed Hamilton of Louisville Kentucky. The 31st USCT was one of 17 regiments that formed an advance line and moved towards Appomattox from the west and prevented Lee's army from escaping. Two Black units from other states were in this line while three other Black regiments were among other Union units positioned in the rear. A number of Confederates surrendered to those regiments and were subsequently paroled under the surrender agreement. The 31st Regiment was one of 32 regiments that made up the 25th United States Army Corps, the only Army Corps in the history of the country to be made up entirely of Black infantry regiments. Within the 25th Army Corps, as organized in the spring of 1865 under Major General Godfrey Weitzel, the Hart Island regiment was designated part of the Third Brigade, under Colonel Edward Martindale, that in turn was part of the Corps' Second Division, under Brigadier General William Birney. After the war the regiment was deployed to Texas and served along the Rio Grande. Three officers and 48 enlisted men were listed as killed or mortally wounded. One officer and 123 enlisted men died from disease. On July 17, 1862, Congress passed two acts allowing the enlistment of African-Americans, but official enrollment occurred only after the September, 1862 issuance of the Emancipation Proclamation. More than 180,000 African American men - a staggering 74% of all free blacks of military age (18-45) -- fought for their country, forming more than 160 units (60 of which engaged in direct combat that numbered more than 250 engagements): 145 infantry regiments, 13 artillery units, seven cavalry groups, and one engineer battalion. Most units mustered in with state designated titles until 1864 when the War Department changed the names to the United States Colored Troops (USCT). The McLean farmhouse at Appomattox Court House, Va., was the scene of Gen. Lee's surrender. The Hart Island-trained 31st USCT was among Union units on the Appomattox field of action forcing the surrender. About 100 Blacks entered as or subsequently became commissioned officers. These included doctors and chaplains as well as staff, line and field officers such as 20th USCT Chaplain George W. LeVere and 26th USCT Chaplain Benjamin F. Randolph. An African-American civilian James B. Schermerhorn was appointed a second lieutenant on July 22, 1864, and assigned to the 20th U.S. Colored Troops. Some other Blacks from New York, but not with the three USCTs from the state, also became officers. These included Stephen A. Swails, a first sergeant with the 54th Massachusetts (commissioned second lieutenant March 11, 1864) and Peter Vogelsang of Brooklyn who eventually became a first lieutenant. The War Department had planned to pay black and white soldiers at the same $13 per month rate but in 1863 a legal ruling resulted in blacks getting $3 per month less. Both whites and blacks protested the discriminatory pay scales, and on June 15, 1864, Congress reinstated the equal pay policy. African-American soldiers comprised 10% of the entire Union Army. From all reported casualties, about one-third of all African-Americans enrolled in the military lost their lives during the Civil War. Twenty-one African-Americans were awarded the Medal of Honor during the Civil War. The monument-related ceremonies in the nation's capital last July paid belated but well-earned tribute to all the more than 180,000 African-Americans who fought to help preserve the Union. Harry Bradshaw Matthews, chair of the Oneonta Commission for Community Relations and Human Rights; Associate Dean & Director of Pluralism Programs, Hartwick College, Oneonta, N.Y., and author of Honoring New York's Forgotten Soldiers: African Americans of the Civil War. Both provided additional facts, leads and guidance helpful in developing this page. We acknowledge a debt of gratitude to LWF editor McRae and Matthews. The 26th U.S. Colored Volunteer Infantry on parade, Camp William Penn, Pa., 1865. 165-C-692. The McLean house where General Lee surrendered. Appomattox Court House, Va., April 1865. Photographed by Timothy H. O'Sullivan. 165-SB-99. The image of USCT soldiers on the History Menu page that links to this page is a scaled-down version of one of those featured in a National Parks Service complex of pages relating to African-American Civil War Memorial.